When you mention the word chutney what comes to mind is the Idly Chutney. These days though Chutney has a larger role to play in terms of being a combination for Dosa, Chapathis and even for Puri. 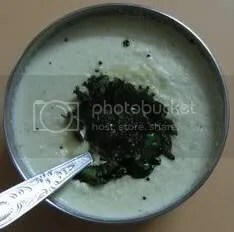 There is also the Chutney Pudi/powder that is prepared at homes in South India which is dry and has a longer shelf life as well. Here I about describing the simple Chutney that we call Hing chutney (asafoetida). 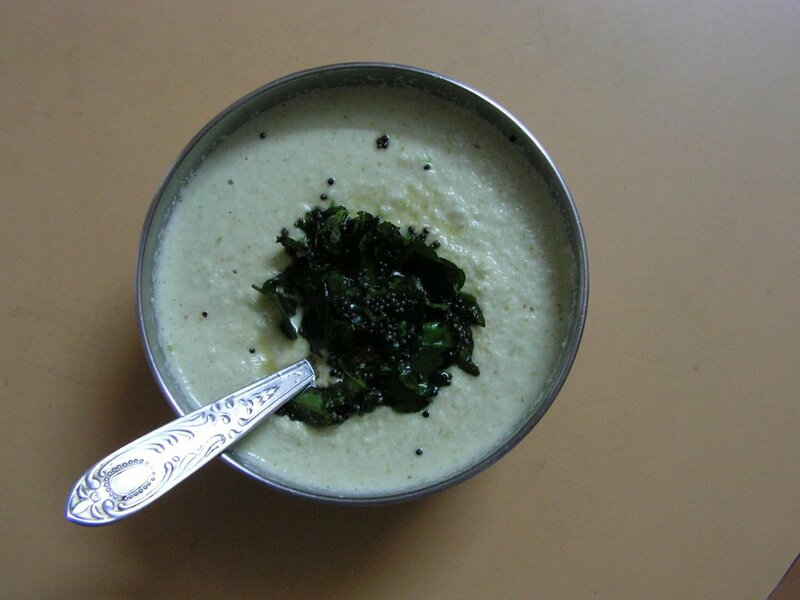 This is ideal chutney for the usual Idlies, and also Khotto (Idli in jack basket which I will soon put up). 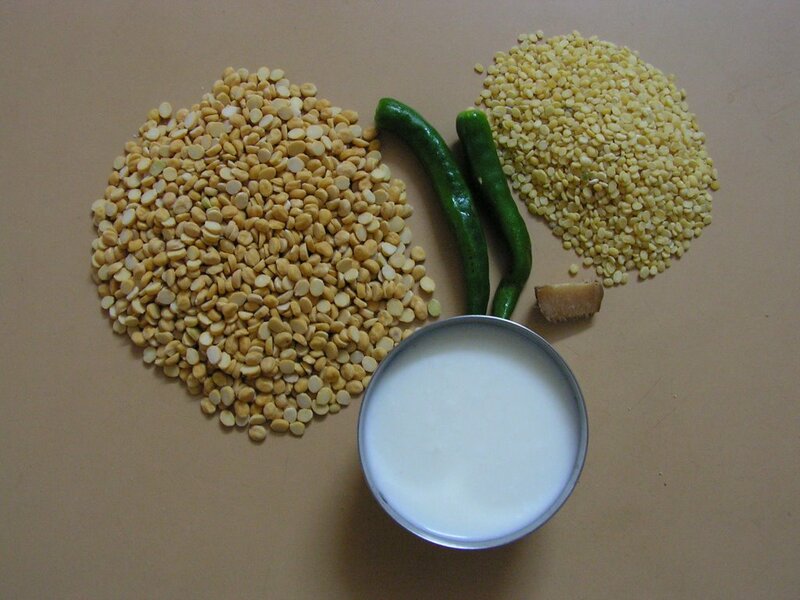 Another reason that Asafoetida Chutney is a good combination is because it contains enzymes that help digestion and is a good antidote to Idly that tends to be a little gastric due to the Urad Dal. 1. In a pan, add oil and fry Urad dal until light brown. Add hing (Asafoetida) and keep it aside. 2. Fry the green chillies in a bit of oil and add to the above. 4. If required, season it with cooking oil, mustard, red chilly and curry leaves. This is the perfect chutney for Idly and Dosas. This entry was posted in Uncategorized and tagged 15 minutes, Wet chutney. 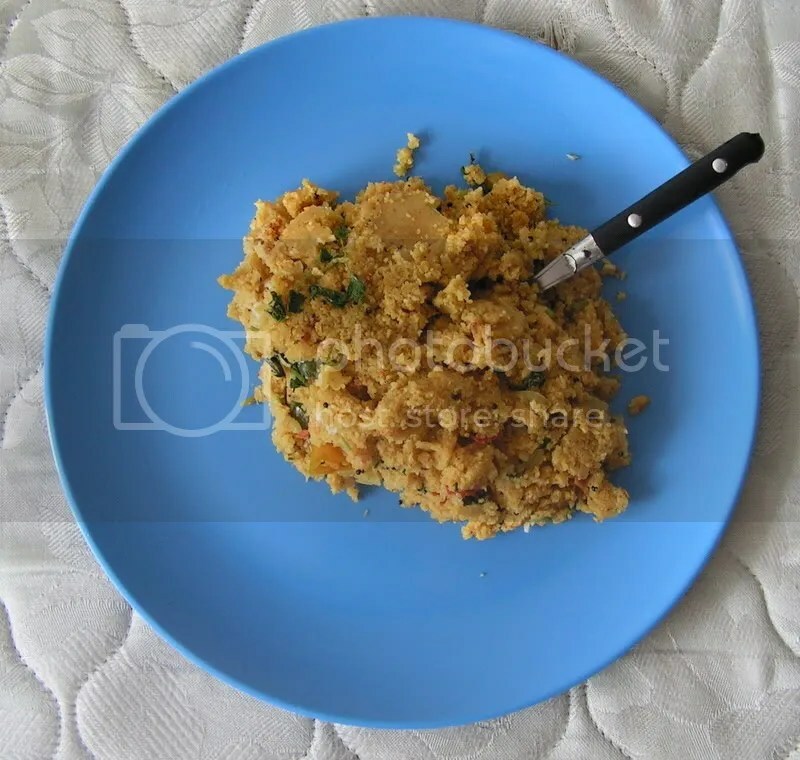 Upma is a common breakfast dish, with Masala Upma being one variety. Upma is one of those dishes that I prefer when I do not want to stand near the hot gas stove for a long time (to make dosas for instance). 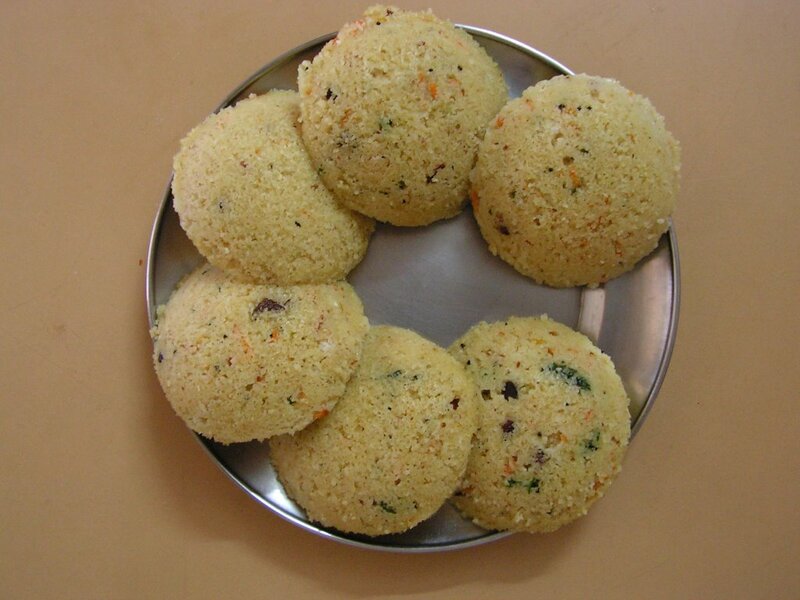 In Kannada and Konkani, we call it Uppittu and in Tamil it is Upma. 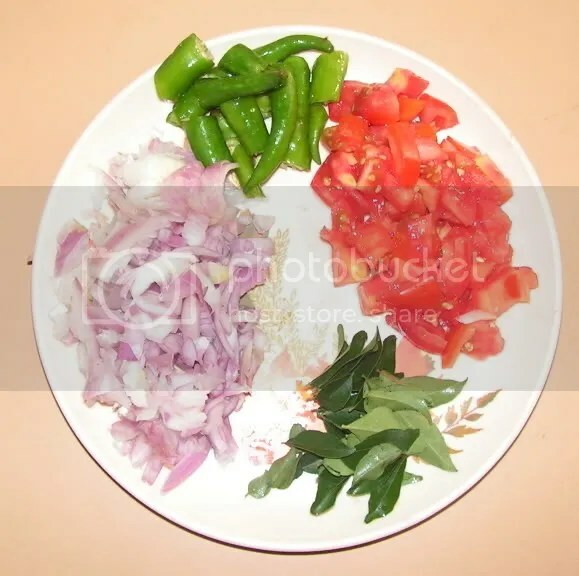 In my childhood, my mother never used to prepare Masala Upma; instead she would only prepare the standard Upma – simple sans tomatoes or onions etc. 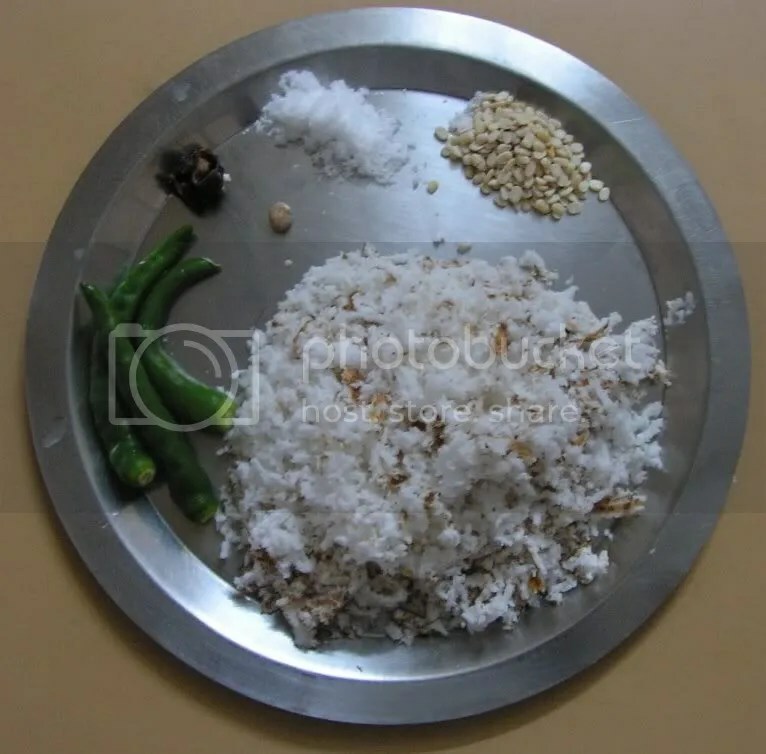 These days however these dishes are more common in most of functions like weddings. Masala Upma can be prepared in half an hour time and tastes great, especially when eaten with potato chips or the usual mixtures (chow-chow). My younger son loves it very much. 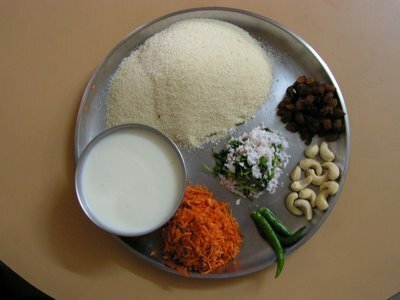 Tip: It is better to prepare it by mixing both Bombay Rava and Bansi or kesari Rava in the required proportion. 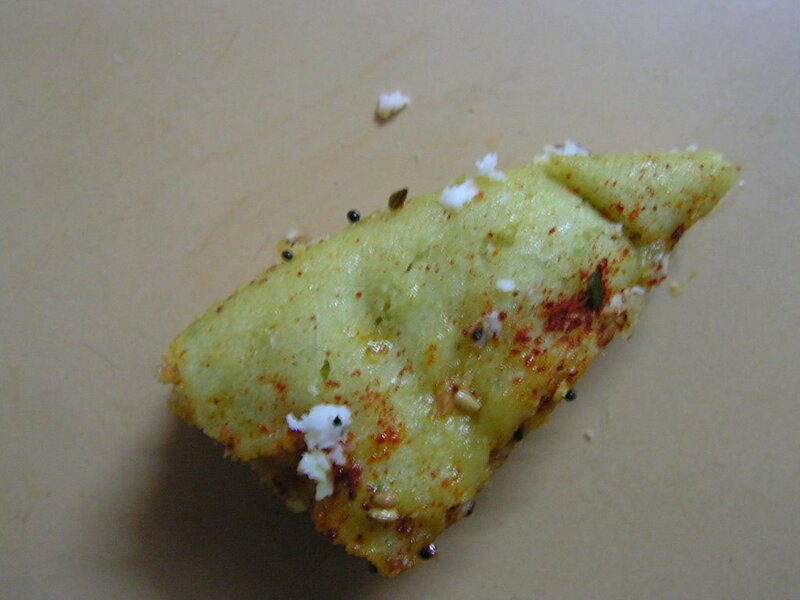 If prepared only with Bombay rava it consumes lot of oil and will tend to form lumps. 1. Mix both Bombay Rava and Kesari Rava and roast them on a medium flame till you get a pleasant aroma and keep it aside. Do not roast it on a high flame to avoid it being burnt and becoming bitter. 2. 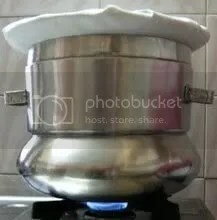 Bring 2 cups of water to boil. 3. 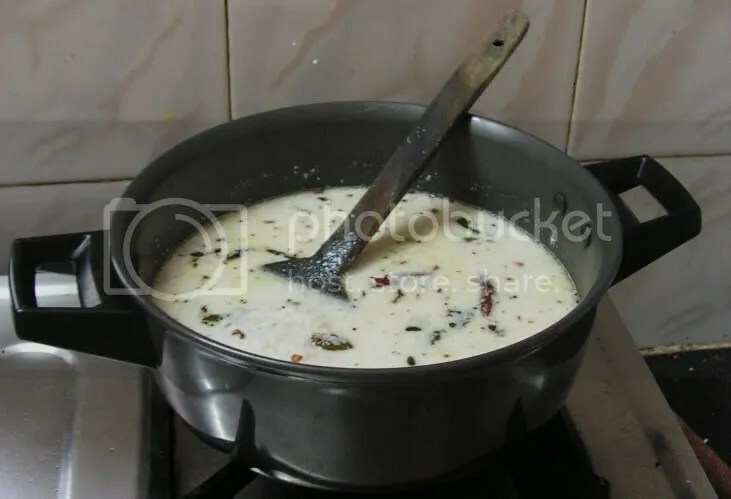 In a thick bottomed wide vessel, pour cooking oil along with mustard seeds and blackgram dal. 4. In a minute or so, add green chillies and curry leaves. Add cut onions and tomatoes to it. Add some salt so that onion will not get burnt. Stir for 2 minutes. 5. Add roasted Rava mixture, sambar powder, garam masala powder and sugar and mix well. 6. Pour boiling water into the above mixture and heat at low flame for 3-4 minutes. 7. Close the pan with a lid and leave aside for 5 minutes. 8. 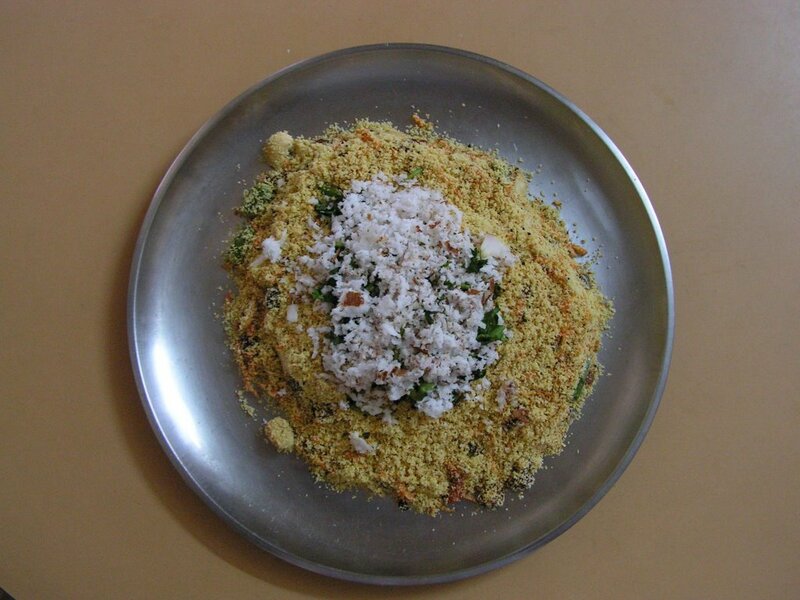 Remove lid and decorate it with corriander leaves, fresh grated coconut. 9. Serve warm with either potato chips or even Haldiram’s mixtures. This entry was posted in Uncategorized and tagged 30 minutes, Breakfast, Tiffin. 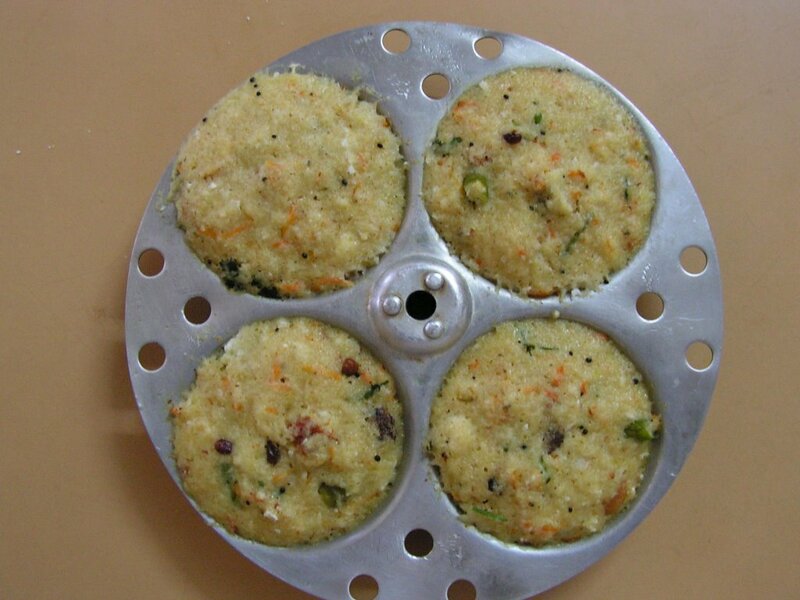 Rava Idli is a favorite dish of my husband. I first tasted it at the Kamat hotel in Bangalore during my college days. They used to serve it with Vegetable Sagu and Chutney; it turned out very well. At home we relish it with fresh onion Chutney. 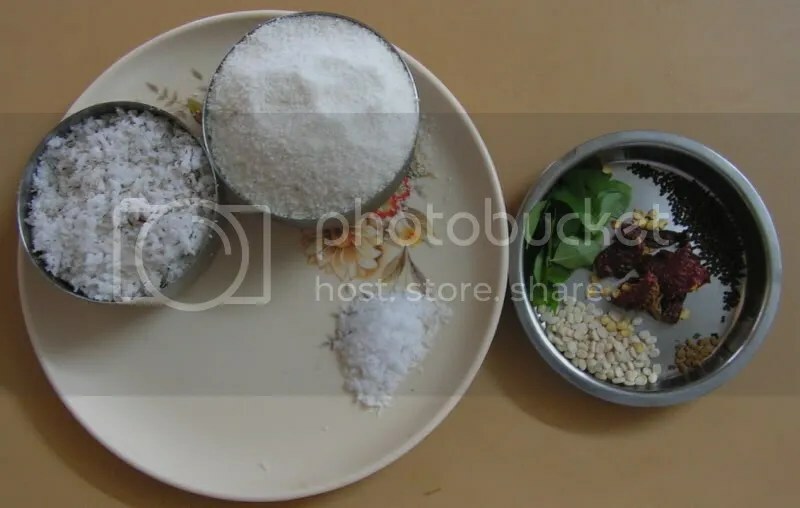 Rava idli mix from several different brands is available in the market, but I prefer to prepare it on my own from scratch. These mixes add preservatives to extend the shelf life. They also do not contain enough quantity of cashews and kishmish. Although these mixes are convenient when the going gets busy, I will recommend you find a relaxed 30 minutes somewhere to give this a shot. Since it takes just 20-30 minutes in all, you have enough time in the morning to make this a part of your lunch box. 1. Place a pan on the gas with oil in it. Add mustard seeds and on popping add Chana Dal followed by cashews, kishmish, grated carrot and green chillies. 2. Add bombay rava and fry it till you get a pleasant smell. By then the grated carrot will have crumpled. See picture below. 3. Switch off the gas and let the mixture cool. 4. Add coriander leaves and grated coconut. 5. Separately mix the curds, water, salt, sugar and cooking soda and grind it in the mixer/blender for about 10 seconds. 6. Now add the mixture (as shown below) from Step 4 to it and set aside for about 20 minutes. 7. 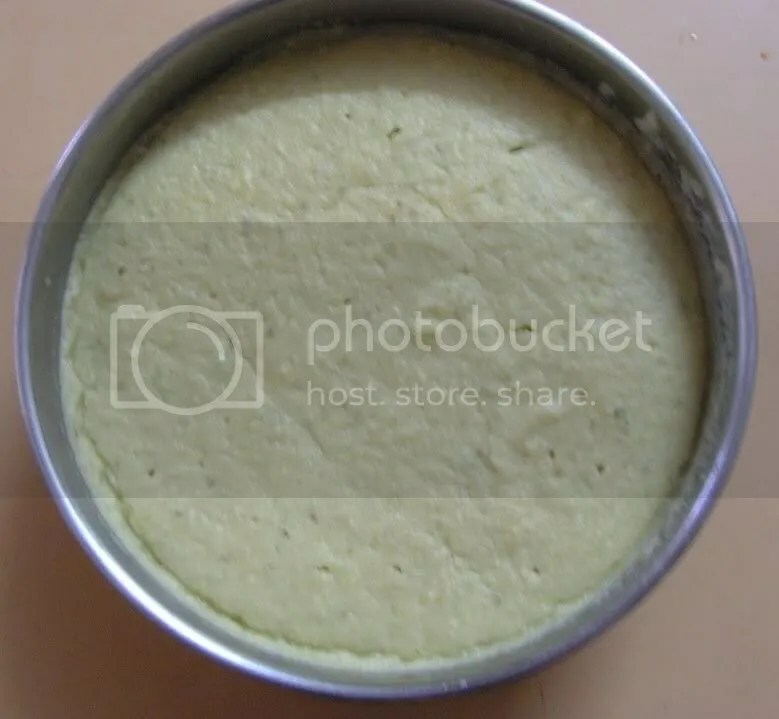 Meanwhile, grease the Idli stand and pour the mixture (from Step 6) into the Idli molds. 8. 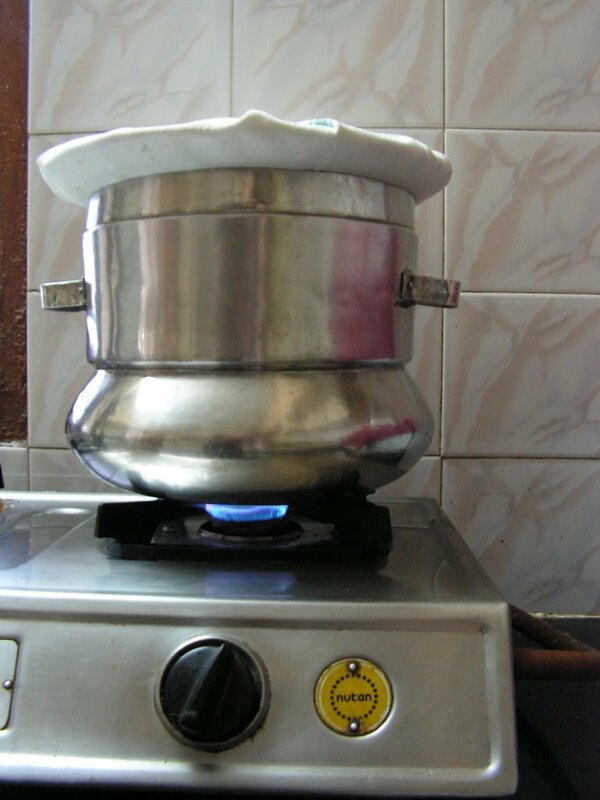 Steam the Idlis in the cooker for about 15 minutes (just as you would steam the regular Idli). The Idlis are now ready to be relished with some ‘super chutney’. This entry was posted in Uncategorized and tagged 30 minutes, Breakfast, Lunch box. 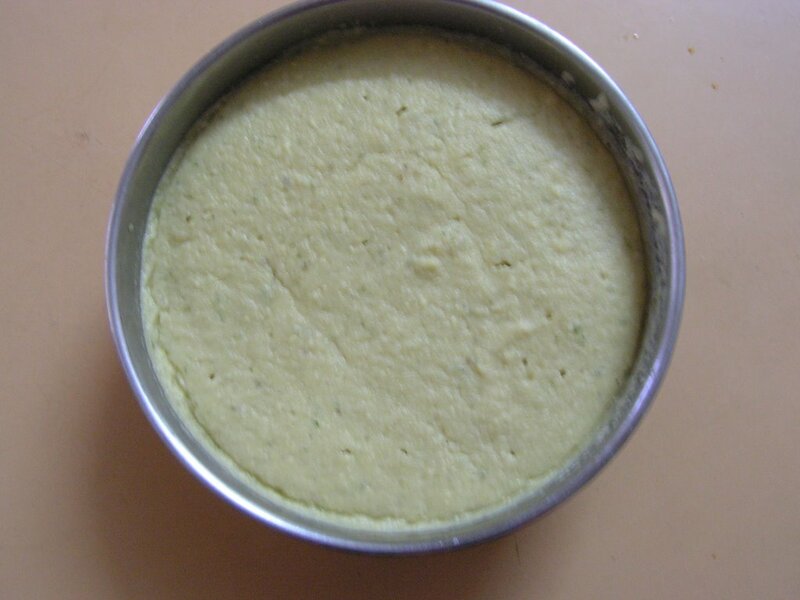 Dhokla is a Gujarati dish. I learned it from one of my friends in Guwahati back in 1991-93. 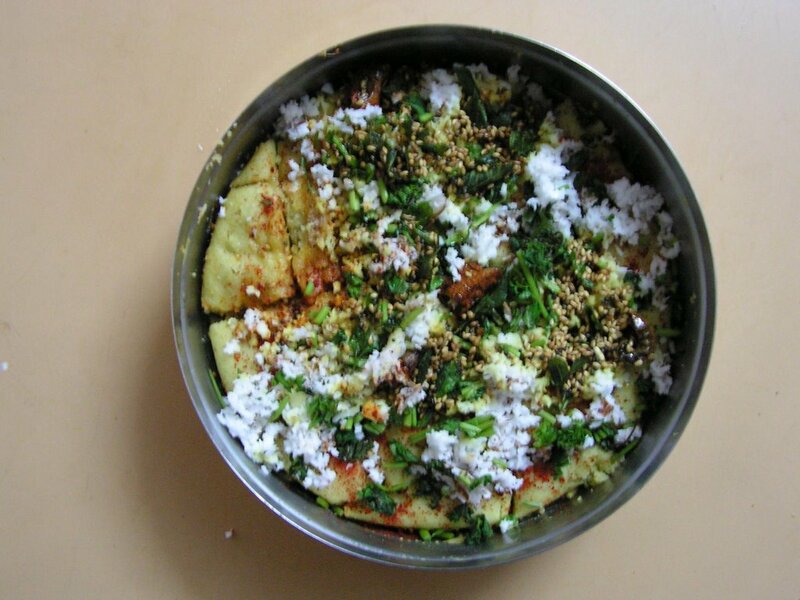 She had once invited us for morning breakfast and the main dish was Dhokla. I liked it and asked her for the recipe. She told me that it can be prepared instantly also . But this is a refined way of preparing it. Of course it consumes time. It has some resemblance to Idli but the ingredients are completely different. 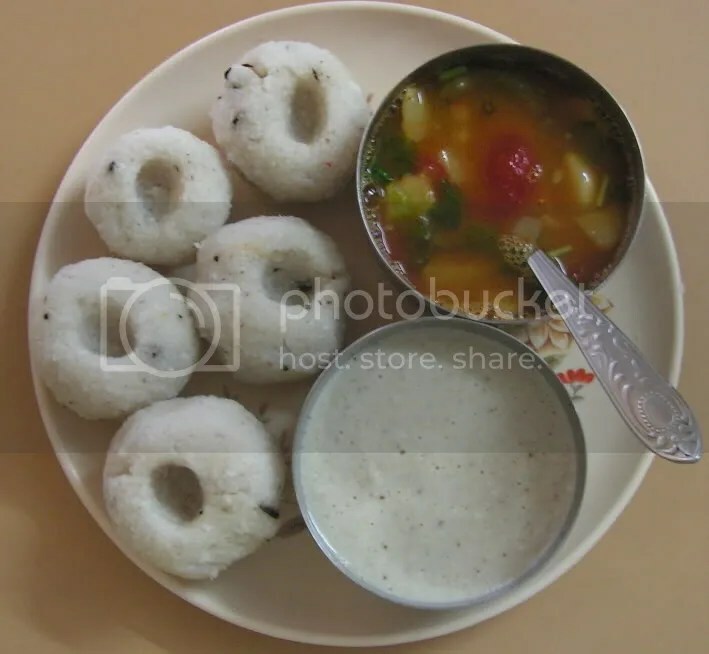 Although we do season Idlis from the previous night/morning, we do not do so with fresh Idlis. 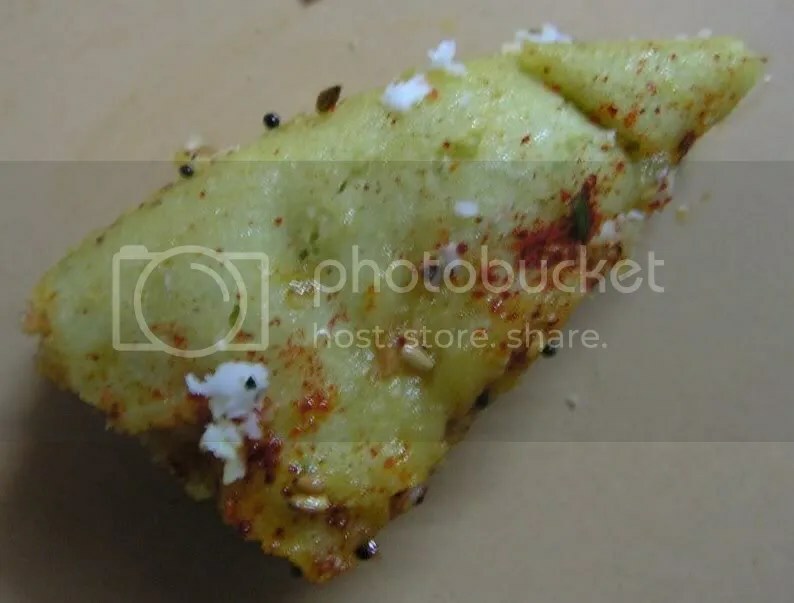 In case of Dhoklas though, seasoning is a part of normal preparation. 1. Soak both the dals together in a bowl for about 2 hours. 2. 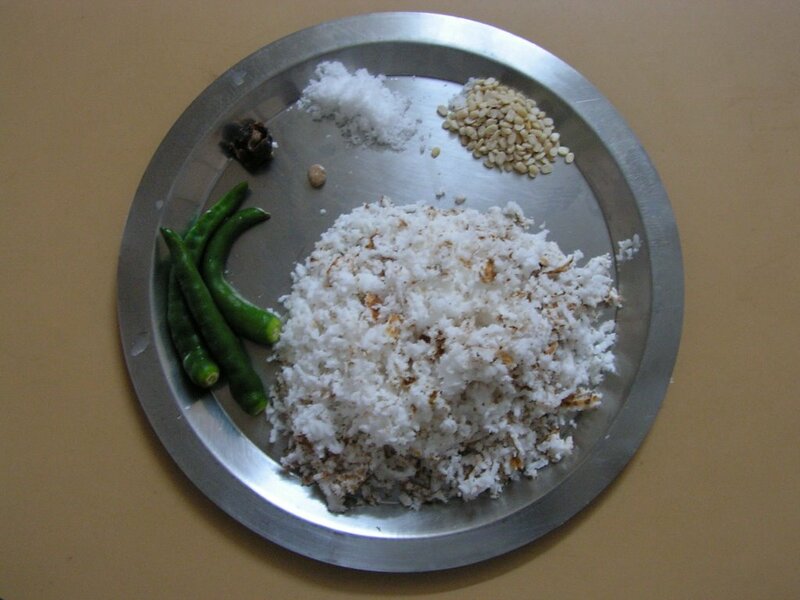 Drain the water and add green chillies, ginger, salt, curds and grind it to a fine consistency without adding water. 4. On fermenting the dough rises in the bowl. Add lemon juice, sugar and cooking oil to the mixture. 5. 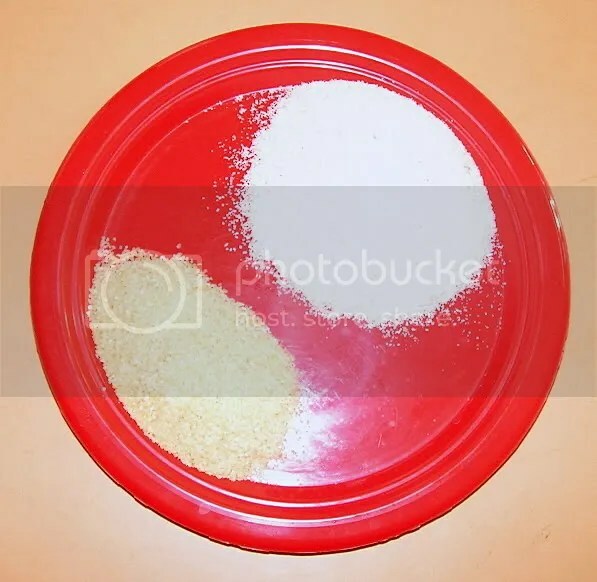 Grease the cooker separators or any round bowl and the mixture in it. Add 1/3 of the Eno sachet. 6. Mix it well and steam it in a broad Idli vessel for about 5 minutes. Closing the lid with a towel so that the steam does not fall over the steamed mixture. 7. Cut the resulting steamed ‘cake’ to the required shape and sprinkle chili powder over it. 8. Steam the remaining half of the mixture like above mixing eno salt to it. ( steaming immediately on mixing with eno salt ). 1. Take oil in a small pan. Add mustard, hing, cumin seeds, red chili shreds, sesame seeds and curry leaves. 2. Sprinkle the seasoning on the dhokla. You may also add some fresh grated coconut and coriander leaves. 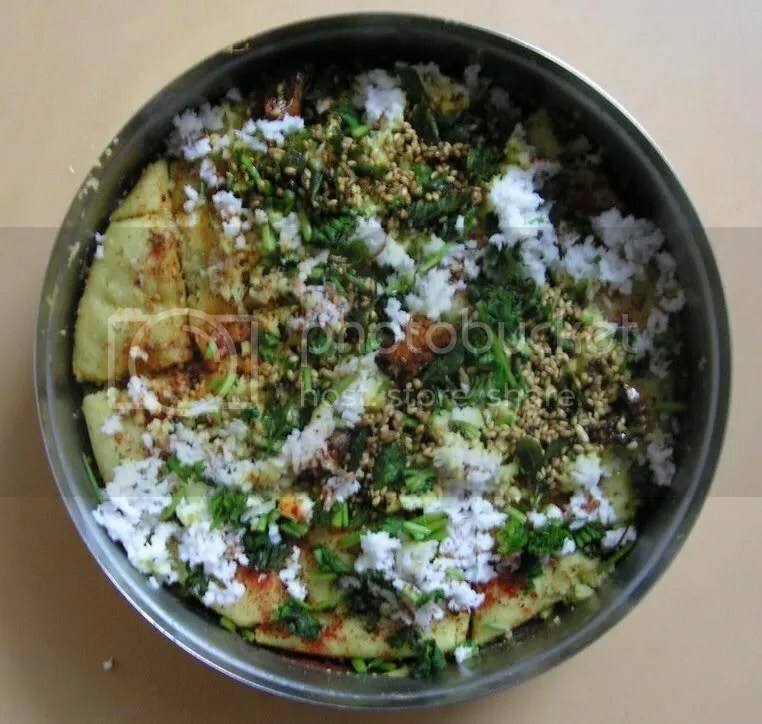 Dhokla can be relished with chutney or tomato sauce. This entry was posted in Uncategorized and tagged Advance planning, Tiffin. When I get up in the early morning with no breakfast plans and there is nothing in the fridge to just warm up and have, thats when Oondi comes to mind. Its an easy dish that can be prepared without any prior preparation such as fermentation unlike with Idlis or Dosas. And all it takes is 45 minutes. 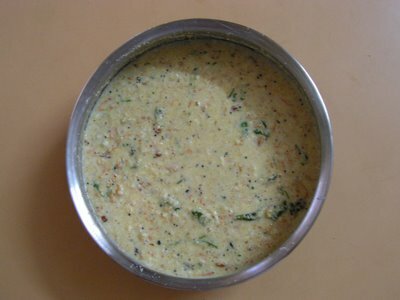 Oondi is a dish of the Konkanis. It is healthy – not spicy and is oil-free. In terms of overall ‘philosophy’ of the dish, it is like Idlis – they are rice-based, they are steamed and are served with either coconut chutney, sambar or with simply coconut oil. Both my kids love to have with sambar, although my husband and I prefer the chutney combination. So in a way, we get to eat with both chutney and sambar. 1. Soak rava in 1 cup of water. 2. Grind grated coconut to a coarse consistency adding remaining 1/2 cup of water. 3. Mix ground coconut into soaked rice rava and set it aside for 30 minutes. 4. 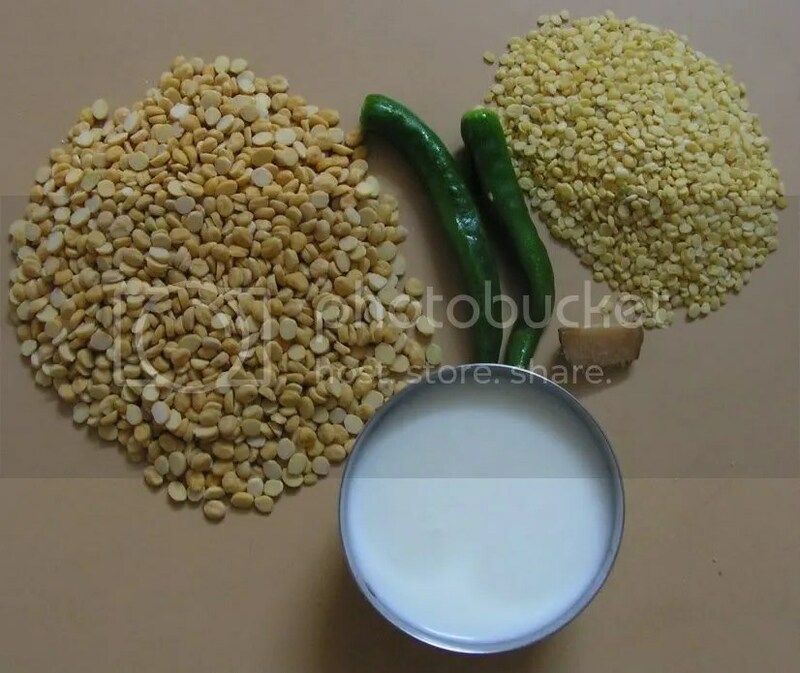 Season with mustard, black gram dal (Urad dal), fenugreek seeds, red chilly and curry leaves. 5. To the above mixture, add the soaked rava. Keep stirring and let it thicken as shown in image below. 6. Make balls (as you would tie a laddoo) with a slight depression (not a hollow, see image below) in the middle. 7. Steam the rice balls in the pressure cooker for about 15-20 minutes. When ready, Oondi may be served with chutney and/or sambar. For sambar , you can refer to my sambar recipe posted now. This entry was posted in Uncategorized and tagged 45 minutes, Tiffin.